This article originally ran in the summer 2014 issue of Fly Rod & Reel magazine. ROTO-MOLDED COOLERS are all the rage these days. In addition to keeping ice for up to five days (under certain conditions), these sturdy plastic chests can also double as poling or casting platforms on a flats boat, or as seats in a drift boat, or as bear-proof containers. Most of these bad boys start at well over two hundred dollars. For that kind of money, anglers should know what they’re getting. 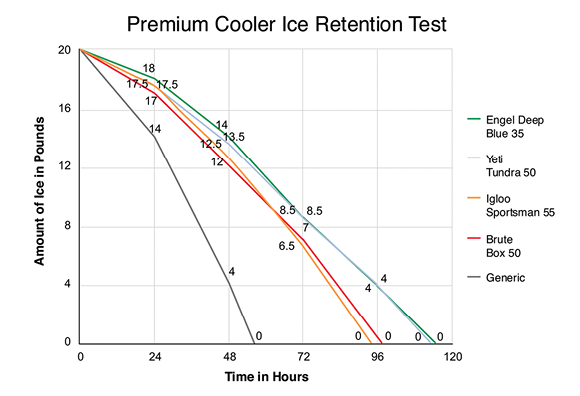 So we decided to find out: We tested four widely available premium coolers (as well as one generic, as a control) in a head-to-head ice-retention throwdown. We also took a good hard look at the various features offered by what are, admittedly, very similar products. For our test we asked each manufacturer for recommendations on the fairest way to conduct our run-off. First, we attempted to secure coolers as close to 50 quarts as possible. Each cooler was loaded with two 10-pound bags of ice, then stored indoors in a climate-controlled space, out of the sun, until all the ice melted. We perforated the bags (so the water could drain), and on each day we weighed the remaining ice with an IGFA-certified Boga-Grip scale after letting the water drain from the bags. We wanted to know whether the famous “five days of ice” claim was legitimate. As you can see from our results, just throwing two bags of ice in a cooler won’t quite get you there. Roto-molded cooler manufacturers advise that—to get the most out of their coolers—one should throw a “sacrificial” bag of ice in on the day before the intended use, then the cooler should be filled to the brim with loose ice encasing the contents. That’s how to keep ice for up to a week. Our “real-world” test didn’t quite match these best-case criteria, but we feel our test realistically challenged the coolers as they would really be used in the field. 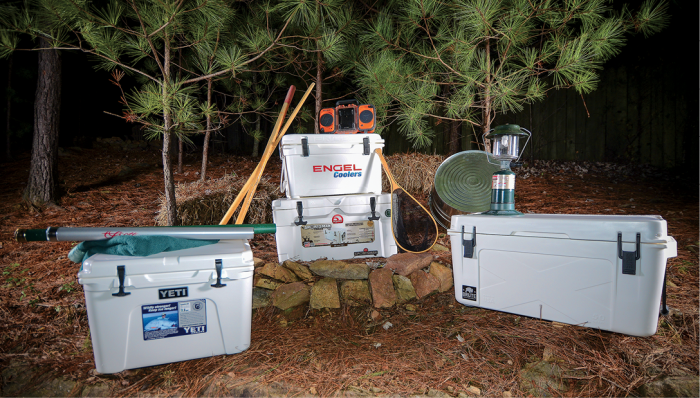 As you can see from our results, the two smallest coolers (the Engel Deep Blue 35 and the Yeti 50) won the overall ice-retention test. This is instructive: In reviewing our results, look closely at the internal capacity of each cooler. Since some coolers were bigger than others, they necessarily also contained more ice-melting air, which we feel was the biggest single factor influencing the outcome. In our opinion, each of these coolers has different strengths and weaknesses. When compared to our generic control cooler, each premium cooler earned an A grade (while the generic got a C- at best). 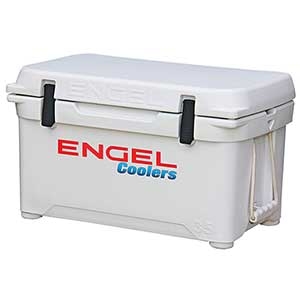 Although the Engel is the smallest cooler in our test, it boasts the thickest interior insulating foam, with two inches versus about one and a half for all its competitors. Engel’s owner and chief designer, Paul Kabalin, highlighted his cooler’s silicone (versus rubber) gasket—meant to prevent gasket compression over time—along with the chest’s bear-resistance certification and its internal supports embedded in the lid (thus giving the top extra rigidity and durability for standing on). We also liked the recessed latches, which prevent fly-line grabbing, and the interior divider. This was the only cooler in our test with prominent stainless-steel latch components; Engel says they are rust proof. At 35 quarts, it lacked the overall sandwich-and-beer-holding capacity of its competition. Engel also makes a 65-quart big brother ($339), as well as a line of accessories that includes SeaDek padding. For more information visit www.engel-usa.com. This is Brute Box’s second generation of roto-molded coolers. Their older chests were quality price-point models; they were as much as several hundred dollars less expensive than the competition, while retaining the core design principles of thick foam and a strong build. Brute Box version 2.0 has upgrades across the board, but still manages to be both the cheapest and lightest cooler in our test for its volume. We were big fans of the burly, solid handles, which made carrying the cooler a relative breeze (though they don’t fold down). We also liked the double self-retaining drain plugs, one on each side of the cooler, which both help the cooler drain and also make “vacuum lock” easier to deal with. (Some of these coolers are so air-tight, when you load them with ice the interior air will decompress, creating a vacuum that makes the lid difficult to open). We were not fans of the traction-less lid surface, and we would recommend applying traction tape or SeaDek before using this cooler as a permanent poling platform, for safety’s sake. As what you might call our cost-benefit winner, the Brute Box gets you solidly into the premium cooler market at a significant savings for its volume. www.bruteoutdoors.com. Yeti is the 800-pound gorilla in the premium cooler market, and with good reason (although they weren’t actually the first company in this sector). Their fit and finish are best in class, with tight seals and hinges, a smooth, glossy exterior, and our favorite lid surface (excellent traction for standing). We are also big fans of their new accessories: a powder-coated steel cup holder so sturdy we were able to actually stand on it once we mounted it to the cooler; and a similarly rugged fishing rod holder (excellent for dunking bait while waiting for a topwater blitz). Yeti also offers custom-cut SeaDek pads, which maintain traction while providing some padding for the man on the push pole during a long day in a microskiff. 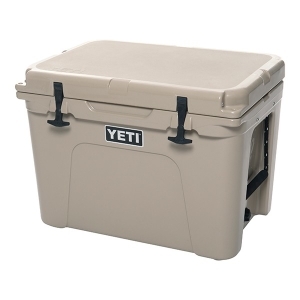 Of course, you pay for all these features: The Yeti is the most expensive cooler in our test by a fair margin. The Tundra 50 also has the most unusual, cube-like shape. An architectural departure from Yeti’s other coolers, this shape gives the user a few extra inches of height (nice from a poling perspective). However, at approximately 43 quarts capacity, this tall cooler was also notably smaller than its 50-quart claimed size. www.yeticoolers.com. Igloo, of course, has been around forever, but they’re new to the roto-molded cooler game. We really like their first effort, especially the smart features, such as fold-down, solid side grips (when compared with the loose cord secondary grips on all competitors’ models, these are more comfortable because they eliminate the dreaded “swing” of a heavy cooler), and the extra-wide drain plug, which makes draining the cooler a snap. We also like the built-in ruler on the lid (great for bluewater applications), and the especially smart locking slot placement, which is front-and-center for easy use. 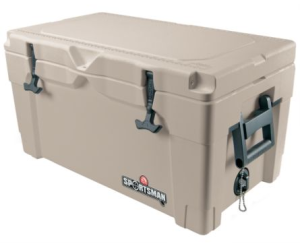 Like Yeti, the Igloo Sportsman is “Certified Bear Resistant” by the International Grizzly Bear Committee. Igloo’s fit-and-finish are a little looser than the competition, mainly in the lid hinges, and the drain plug retention cord is a simple bead chain (easy to break). Igloo designed this cooler to have the same dimensions as their popular 94-quart Marine model, meaning it should drop right into many boats with built-in cooler slots. Moreover, Igloo has periodically released these coolers through warehouse retail stores like Sam’s Club at significant discounts: If you stumble across such a sale, we recommend you snap one up. www.igloocoolers.com. 5 Responses to "Premium Cooler Throwdown"
I enjoy listening to your podcasts. When might there be a new one coming online? Recording the first new show of the fall season tonight, and I have a couple guests lined up thereafter. These take a surprising amount of work on the front end, which is why they come in fits and spurts like this. Ideally they’d be weekly but, unfortunately, they’re too time-consuming. I wish that Yeti Tundra 50 cooler had wheels as I see it had to transfer it when it’s full and it becomes heavy.